White or translucent bottles made from PP. 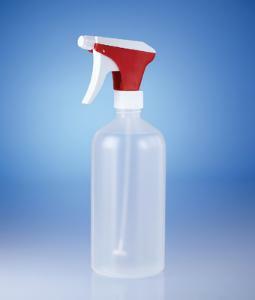 Sprayer insert with stable, smoothly operated pump trigger and adjustable spray nozzle, which can be regulated from the finest mist (nebulising) to a precise liquid jet. Range: approx. 3-4 meters. Ideal for spraying detergents or disinfectants, especially into difficultly accessible areas, as well as applications in thin layer chromatography.